Already at the age of three, fascinated by Infinity, Durgananda decided that she would be a physicst when she grew up. As a young girl she spent most of her free time reading science fiction and futuristic utopian literature, and at the age of 11 she designed her first utopia, called “Ecstase”. As a young woman she began her undergraduate education in physics and philosophy at the University of New Orleans, and after two years took a pause in 2004, leaving the United States for the first time in her life, beginning a spiritual quest spanning 10 years. In 2005 she walked the 1,200 km Buddhist pilgrimage O-Henrosan, praying at the renowned 88 temples of Shikoku island in Japan. Over the next few years she discovered the subjective sciences (including meditation and tantra), and was excited by the idea of a Grand Unified Theory in which the subjective and objective means of information acquisition could both be utilized to create a complete model of the universe. On her journey, Durga completed five more years of university studies in Physics. She received her bachelor’s degree from the University of Geneva in Switzerland in 2010, and continued with graduate studies at the same institution. Her graduate research was in theoretical physics and included Kaluza Klein Theory, StringTtheory, Statistical Field Theory, and the AdS/CFT correspondance. As well, she completed two internships, one of which was at the LHC at CERN. Her scientific formation has proven to be a rich addition to her perspective and approach in her teachings of prana, chakras, kundalini, energy channels, and dimensional reality. 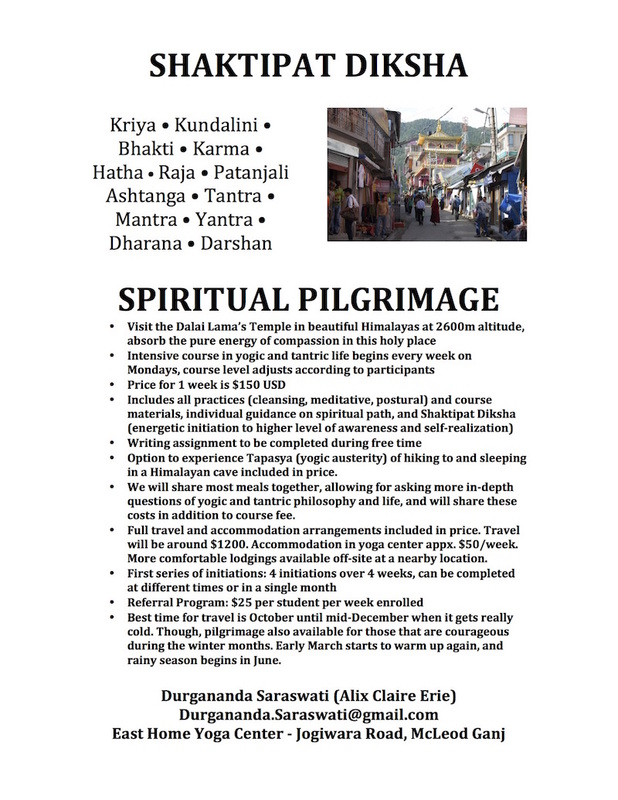 Durga is also formally trained in the ancient traditions and science of Raja Yoga (translated as “the royal path of yoga”), which includes traditional Patajali Ashtanga yoga ( translated as “the yoga of 8 stages”), Kundalini yoga, Kriya yoga, Karma yoga Bhakti yoga, Mantra yoga and Dhyana yoga. She received Yoga Teacher Certification in association with the Satyananda tradition and certified under the Indian university system from Yoga Vidya Gurukul in Nashik, India in 2006. In 2010 she returned to her beloved ashram in the holy Trimbakeshawar, one of the 12 ancient Jyotirlingams, for the Diploma in Yogic Studies (Advanced Yoga Practices). In 2012-2013, during the last months of her master work in physics, Durga had a series of awakenings, bringing her to the realization of her true calling to be channel for the divine will, providing access to self-realization for all seekers who cross her path. At this time she left the academic sciences to pursue the manifestion of her vision of ACE and performed a complete renunciation of all her belongings (More). 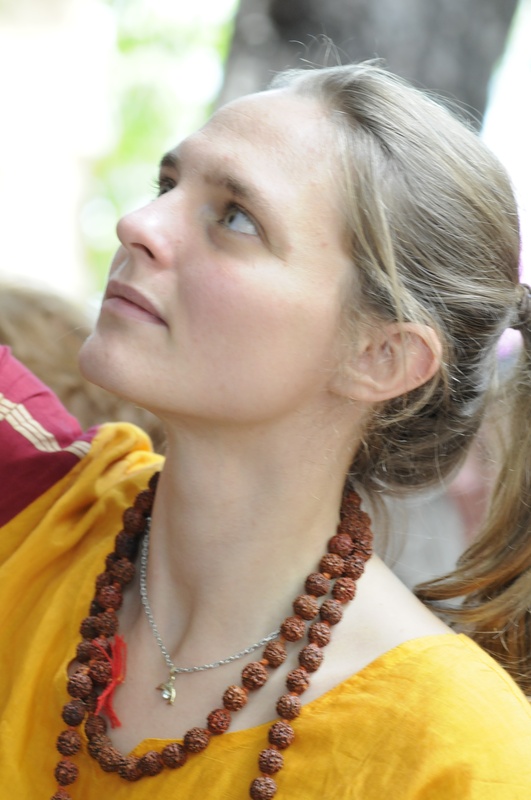 She then traveled for a year visiting and working in several different countries, spiritual communities, and ashrams, and is now temporarily based again in Geneva, Switzerland. Combining rigorous discipline of physics with complicated eastern philosophy must be one the most difficult tasks no one has ever tried to achive by now. i belive this website will serve as means to broaden ones horizon after realizing what Durgananda Saraswati has achieved by obtaining knowledge through two of three, including Gnosis and Mathesis (knowledge through intuition).